Old dog anxiety is rather common – my old dog Hana had it – and it is not difficult to understand why older dogs tend to be more anxious. Having to deal with anxiety in an old dog is not easy, to say the least. But, as you can see, there are quite a few drugs (and natural remedies) that can help. So… don’t despair and read on! But what exactly is anxiety in dogs? Anxiety in dogs is the anticipation of a future danger. For example, when you are getting ready to go to work, your dog (if she has separation anxiety) will start reacting as she is anticipating danger after you are gone. Sometimes the dog may even become destructive. You have probably heard stories of anxious dogs breaking down doors so as to escape from the situation. Other times, the dog may be self-destructive – she may start chewing and licking herself obsessively and incessantly, until her skin becomes raw and infected. Perhaps the most common reason is the simple fact that their senses are not as sharp as before. They can’t see well and their hearing is going, and they have no idea what’s going on with them! It’s no wonder that they don’t feel safe even in their own homes. And they definitely don’t want to be left home alone! Any physical issues that cause chronic pain and discomfort can understandably cause stress and anxiety in old dogs. Common old dog illnesses, such as arthritis, gum disease, diabetes, hypothyroidism, can trigger anxiety in old dogs. If an aging dog has cognitive dysfunction (doggie Alzheimer’s), she may also show signs of anxiety as there may be changes in the dog’s nervous system. So… if you have an aging dog who lately has started to show some signs of anxiety, check to see if she can hear well, and check her eyes for signs of cataracts (e.g. cloudy eyes). Also, check for signs of pain – Is she walking with a limp? Is she favoring one limb? Does she cry out when you touch certain part of her body? Look inside her mouth – Can you see bleeding gums? Or a broken tooth? Or worse, any abnormal growths? Is your dog showing signs of doggie Alzheimer’s? Not sure? Download this canine cognitive dysfunction checklist. Check to see if your dog is showing some of the signs on the list. 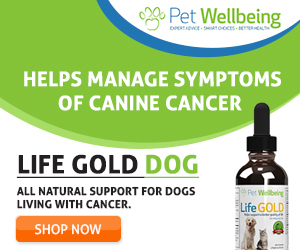 Once you have taken steps to try to find out what causes anxiety in your old dog, and you think you have it pinpointed, go and talk to your vet to come up with the best plan of action to help your dog. Don’t try to take matters in your own hands if your dog has serious anxiety issues. She may hurt herself and may even destroy your house! Work with your vet to decide what works best for YOUR dog. Your vet may prescribe some anti-anxiety medications, plus suggestions of behavior modification as treatment of your dog’s anxiety issue. I fully understand where you are coming from – and I agree that we shouldn’t just load up our oldies with drugs. But, there are times that medications are needed, and serious anxiety in dogs is one of such times. These drugs could be a life-saver especially if you had a dog with serious anxiety issues. Benzodiazepiens (BZs) is a group of anti-anxiety drugs that are fast-acting but short-lasting (only for a few hours). Commonly prescribed BZs include Clonazepam (Klonopin®) and Diazepam (Valium®). These drugs should be used on an as-needed basis only and should not be used long-term. 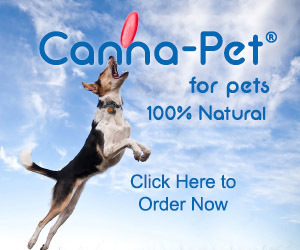 Otherwise, your dog may become dependent on the drug. Your dog may need BZs if she only develops anxiety in certain situations. One example is if your dog gets really freaked out during a thunderstorm, and no amount of natural remedies can help, then you may consider asking your vet to prescribe some BZs to use as needed. In addition to the above, there are slow-acting drugs that can be used long-term, for more generalized types of anxiety. One group of slow-acting drugs is called Tricyclic Antidepressants (TCAs). One commonly prescribed TCA is Clomipramine (Clomicalm®). You should start with a low dose, and then increase every two weeks as needed. Since TCAs are slow-acting, it may take several weeks’ treatment to see their effects. TCAs are good for anxiety (including separation anxiety) and compulsive disorders, such as tail chasing. TCAs can cause bone marrow suppression. If your vet prescribes Clomicalm® for your old dog, make sure that he does blood work 2 weeks before and 2 weeks after starting the drug. After that, blood work should be done every 6-12 months to make sure everything is fine. Another group of slow-acting anti-anxiety medications is called Selective Serotonin Reuptake Inhibitors (SSRIs). These drugs are stronger, longer-lasting, and more effective than TCAs. But more time is needed to fully assess their effects on individual dogs. SSRIs are also safer than TCAs (no blood work needed), but can cause sedation and tummy upset in some dogs. SSRIs are used to treat anxiety, including separation anxiety, obsessive behaviors, and panic disorders. Fluoxetine (Prozac®) is an example of SSRI. No matter what kind of medications you and your vet have decided on, do remember that medications alone cannot solve the problem. You also need to modify your dog’s behavior. If necessary, work with a dog trainer or animal behaviorist. What if your dog’s anxiety is not so serious as to warrant drug intervention? Don’t worry – I’ve got you covered too! 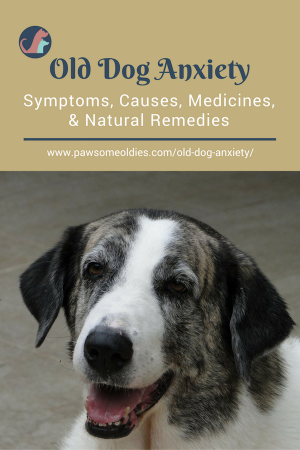 See this page for some natural remedies to help anxiety in old dogs. 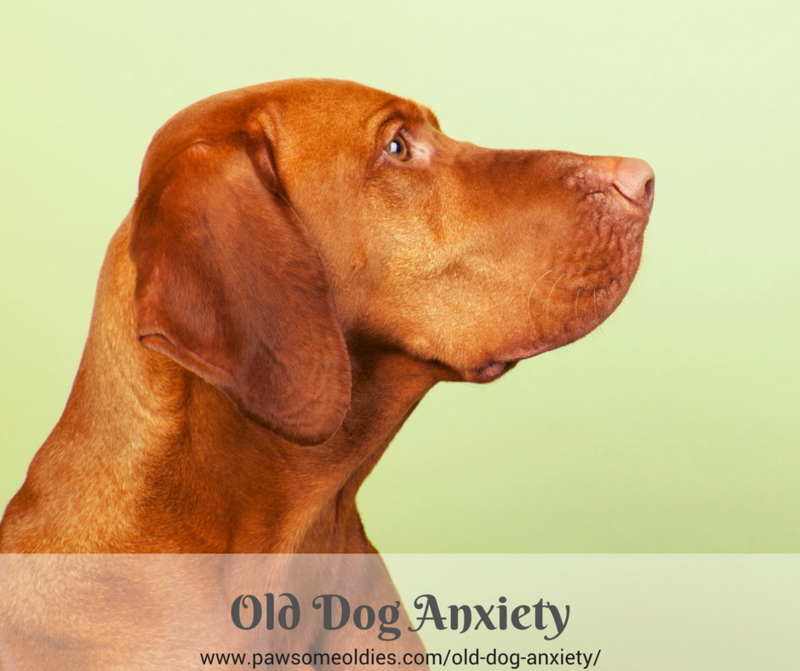 Also see this post for specific information on how to use essential oils for anxiety in old dogs.